So after a month now I can give you guys more an in-depth review of these products that was sent for free by Influenster. If you guys like to sign-up, you need to be invited by a member. I have four invitations left so just comment down below with your email and I will send you an invite! 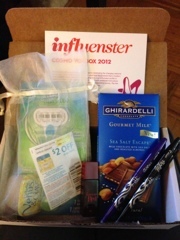 I am not sure how often you will be sent one of their boxes, for me it took a while and only at the time I was very active online with all my social apps and on their website that they sent me a pre-qualifying survey for a box. So it takes a lot of patience to receive one of these boxes, but anyways let's get to the review! 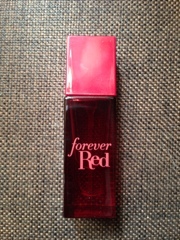 1- Forever Red Exclusively at Bath&Body Works: I would not have thought of purchasing this if I tested it at the store since it's not really my type of scent to wear daily. Any fragrance with vanilla in it, I actually stay away from because I just don't like the lingering smell of sweet vanilla on me all day, but this fragrance is pretty subtle. It doesn't have that strong musky, overly sweet vanilla smell as you spray it on and as the day progress the smell gets "softer" ?!? That might not be the right term but in short it's a scent that is perfect for the winter season, not too heavy not to light of a scent. 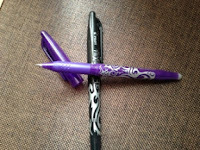 2- FriXion by Pilot Pen in Black and Purple: I wish I had these pens when I was in school! I have always used Pilot pens since I stole my first one from my Dad when I was 7 I think. I love how smooth this FriXion pen writes! And the no-mess eraser works like magic! You will not find a trace of your mistake with this eraser and none of those little rubber dusts everywhere. I've been using this to get one of my 2013 Resolution done which is to write my husband little love notes everyday. My only concern is, I'm a push pen kind of gal so hopefully in the future this comes out in a push pen style so I don't have to take off the cap when I need to use the eraser, and I would hate myself if I lose the cap on this awesome pen. 3- Gilette Venus Embrace Razor & Venus Olay Refill Razor: Both razors have 5 blades in them and that scared me a little bit. I am not a hairy monkey that I need a 5-blade razor to shave but these weren't that bad! I've always used Venus razors and I always go back to them after I try out the other brands since this is the only brand that shaves so smoothly. The Embrace Razor though was too much for my skin that it did irritated my skin afterwards. But the Olay Razor is awesome! I wet the blade to lather up the moisture bars before I start shaving! My skin feels great, no irritation and no razor bumps. I will definitely going to be repurchasing the Olay razor! *apologies for not having a picture for this. I forgot to take a picture of it before I used them. 4- Ghirardelli Gourmet Sea Salt Escape Bar: I wasn't sure about this bar when I saw it had almond bits in it. I am not a fan of chocolate with nuts in them unless it's the M&M Peanuts, but everything else is a no! With my first bite, I was...eh! I can taste the sea salt in the milk chocolate and would love to taste that more if only the almond bits weren't in the way! 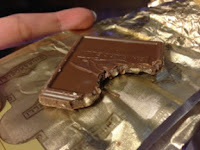 The next day I gave it another try, even my husband who doesn't like nuts ate two squares! The mix of the sea salt and the almond bits actually breaks up the sweetness of the milk chocolate that you can actually finish this bar in one seating! Just be prepared to floss after eating since the almond bits do get in between the teeth. My favorites, I gotta say are the FriXion pens and the Gilette Venus Olay razor from this box and would definitely would be purchasing and recommending them.